You guys know that Georgia has been eating table food since about 5-6 months. The first thing we introduced her to was peas, orange slices, sweet potatoes, and eggs. She loved it all and has never been picky about anything at all. Once she turned one it was time for her to have 3 meals and milk was not considered to be a "meal" anymore. This girl has a big appetite and will eat whatever is put in front of her, but I do want to make sure that we are making good decisions for her and showing her healthy eating habits, but still having fun snacks and treats now and again too. Breakfast—a Kashi whole grain waffle or scrambled eggs or egg muffins. The egg muffins I made with ham, egg, and cheese in a mini muffin tray. I cut them up for her and give her usually 2 of them. She's getting a lot of protein from those and she loves them. Snack—string cheese (is life) is a healthy snack option that G absolutely loves. We also do pouches because they're easy and overall pretty healthy. I like that I can throw them in my diaper bag and carry them whenever I need them and they're not super messy. 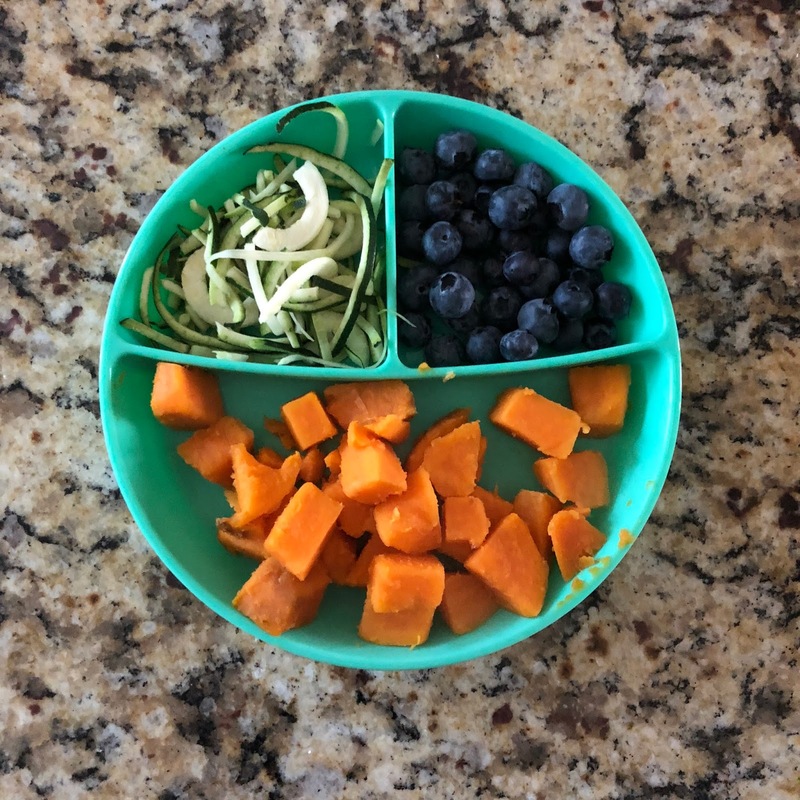 Lunch—chicken breast, cheese tortellini or pasta, blue berries, sweet potato, or rutabaga. This was easy, I bought a package of Simply Organic chicken breasts from Target, found in the frozen section, cooked them all up in a crock pot on a Sunday, cubed it and then froze bags w/ individual servings. The tortellini & pasta I cooked up and sent some to daycare & used the rest for her for dinner throughout the week. I've also bought fruit cups and drain all the juice from them since they're loaded with sugar and give her just the fruit. Not my favorite choice, but they work in a pinch. 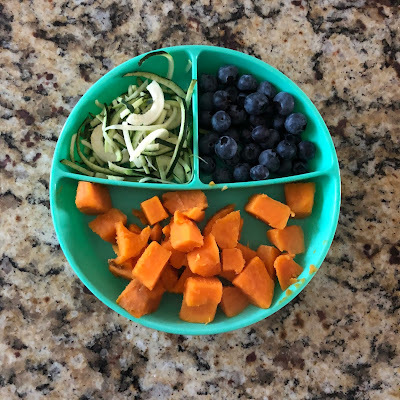 Snack—I bought these little veggie puffs from Aldi and they're not a huge hit with her, but she will eat them. We also do bananas, more string cheese, more blueberries, Cheerios, or a puree pouch. I also give her the egg muffins for a snack. I haven't had an opportunity to make much more than this since we just started doing this within the last few weeks, but so far it's going well. I don't want to make too much work for myself so I try to prep her things on Sunday since she goes to daycare on Monday morning. Then for Thursday I usually will take out a bag of the frozen chicken & add my couple of sides. She is still drinking breastmilk and is loving whole milk. She also has a cup of water out for anytime she is thirsty. She's honestly doing great with all of it. At her wellness check she was 19lbs 11oz, but has gone up from 37th percentile to 50th percentile even though she's on the more petite side. She went up 2 pounds in 3 months which is more than likely from the influx in real foods she's been eating. She is also 30" long (34th percentile) and her head circumference was 48cm. which puts her in the 99th percentile. I always tell her she has a big doctor brain in there. Luckily she looks pretty proportionate even though her head sounds like it is ginormous based on these stats! I'm planning on building on this post as we continue to create more meals for her. These are great ideas! She eats so good. I am constantly looking for things to make Bowen. It seems like the older he gets the pickier he gets. It's like in the beginning when they start eating real food it's so good they will eat anything! Once they figure out there is a choice all bets are off...or maybe just my kid..ugh. Yummy! What a good little eater!